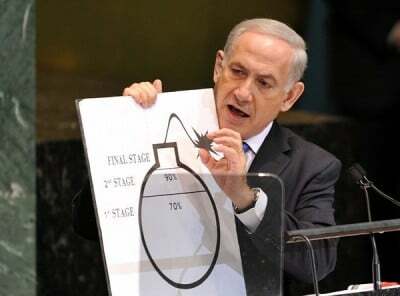 Israel’s Prime Minister is well-placed to explain to the U.S. Congress the alleged danger of a nuclear Iran. After all, it was Israel and its allies in Washington who fabricated this issue to begin with. It is thus incumbent upon Mr. Netanyahu to try to give credence to that allegation even as U.S., European – and even Israeli – intelligence agencies agree that Iran is not trying to produce nuclear weapons. Some may remember that the claims that Iraq possessed weapons of mass destruction had come largely from the same people close to Israel’s right-wing Likud party. The role of this Likud lobby has been seminal in stirring the campaign against Iran. It was at the AIPAC meeting in Spring 2006 that Iran was made a special target, with giant screens alternating clips of Adolf Hitler denouncing the Jews and then the Iranian President Mahmoud Ahmadinejad threatening “to wipe Israel off the map”. The show ended with a fade-out to the post-Holocaust vow “Never Again.” Within months, the lobby distributed anti-Iran press kits to thirteen thousand journalists in the United States alone, durably embedding these emotionally charged images in mainstream media. Iranian leaders have been routinely portrayed as deniers of the Holocaust who threaten to wipe Israel off the map. These two claims have been reproduced in thousands of newspapers, depicting Iran as a rogue state and a danger to world peace. They have also been used to impose Western sanctions on Iran for allegedly trying to produce nuclear weapons. Millions of Iranians suffer from these sanctions, and many more may suffer from military action that remains “on the table” in Tel-Aviv and Washington. This is why these claims, which present Iranian decision-makers as irrational Jews-haters, deserve closer scrutiny. The issue of Iran’s nuclear programme requires cool-headed analysis. However, conflation of Israel and Zionism with Jews and Judaism has long stifled rational debate concerning the Middle East. This is how critics of Israel, whether Gentile or Jewish, are routinely accused of anti-Semitism. Such accusations have come to impact international relations on a larger scale, and “Iran’s nuclear bomb” is a case in point. Mr. Netanyahu arrives in Washington pretending to speak on behalf of world Jewry rather than as an elected representative of Israeli citizenry, at least one third of whom are not Jews. Among the participants at an international conference on the Holocaust convened by the former Iranian president nearly a decade ago there were a few notorious Holocaust deniers as well as black-clad Orthodox Jews who spoke of the massacre of their own relatives at the hand of the Nazis. It is of little practical interest to debate whether Mr. Ahmadinejad denies the veracity of the Holocaust since he has long been out of power. But one may wonder why we tend to consider Holocaust denial as exceptionally grievous. Indeed, a denier of the massacre of hundreds of thousands of Jews in Ukraine in the 17th century or of the expulsion of Jews from Spain in the 15th would attract no more attention than a member of the Flat Earth Society. It is not only the immediacy and the magnitude of the Holocaust, but the Zionists’ uses of its memory that make it unique. Iranian leaders were not the first to decry the price that the establishment of the state of Israel has exacted from the Palestinians (Muslims, Christians as well quite a few Jews) who have been made to pay for the crime committed in Europe by European Nazis against European Jews. Whatever this objection is worth, it is not a denial of the Holocaust, but rather an objection against using this tragedy as a tool to legitimize Zionism and Israel’s continuing dispossession of the Palestinians. “the Shoah [Holocaust] is an oft-used instrument. Speaking cynically, it can be said that the Shoah is among the most useful objects for manipulating the public, and particularly the Jewish people, in and outside of Israel. In Israeli politics, the Shoah is held to demonstrate that an unarmed Jew is as good as a dead Jew”. Even the best friends of the Jewish people refrained from offering significant saving help of any kind to European Jewry and turned their back on the chimneys of the death camps… therefore all the free world, especially in these days, is required to show its repentance… by providing diplomatic-defensive-economic aid to Israel. Norman Finkelstein’s Holocaust Industry amply documents how the memory of the Nazi genocide can be harnessed for political purposes. For decades, the Holocaust has functioned as an instrument of persuasion in the hands of Israeli foreign policy to mute criticism and to generate sympathy for the state, which styles itself as the collective heir of the six million victims. Mr. Netanyahu regularly invokes the Holocaust in public debate about Iran. He claims that the hypothetical Iranian nuclear bomb constitutes “an existential threat”. However, in a peculiar non sequitur he calls Israel “the only secure place for the Jews”. In the wake of the recent attacks on Jews in Paris and Copenhagen Mr. Netanyahu again called on European Jews to leave their countries and move to Israel that he referred to as their “real home”. His invocations of “a nuclear holocaust” at the hands of Iran play well among his supporters but hardly represent a rational foreign policy argument. None of this seems to imply military action and cannot be interpreted as an “existential threat.” This may explain why none of this catches the attention of mainstream media: moderate statements from Tehran are not deemed “fit to print”. Iranian leaders have also said that “the Zionist regime will be wiped out soon, the same way the Soviet Union was, and humanity will achieve freedom.” Just as the Soviet Union was dismantled peacefully, Israel may disappear peacefully under the weight of its internal contradictions. Just as the Soviet Union was not wiped out in a hail of nuclear bombs, Iran does not suggest using force to bring about the demise of Israel. Nor would this be even remotely serious since Israel enjoys an overwhelming military superiority in the region, in which it remains the sole nuclear power. The call for an end to Zionism does not mean the destruction of Israel and its population. According to Jonathan Steel of The Guardian, it is no more than “a vague wish for the future”. This wish may amount to no more than the prayer “for the peaceful dismantlement of the Zionist state” uttered regularly by members of the Jewish anti-Zionist group Neturei Karta. In fact, Jewish liturgy itself abounds in rather aggressive stances against those who do not recognize God or commit evil acts. For example, in the High Holiday services, we have the phrase u’malkhut ha’rishaa kula ke’ashan tikhleh (And the kingdom of evil should disappear like smoke). Again, although this literally means to annihilate and destroy a whole country, what really is meant is that the “regime of evil” – any acts of evil done in any place – will be wiped out. Not any person in particular, certainly not thousands of innocent people. Even though millions of Jews recite this every year, they don’t mean nuclear war. But if one wanted to demonize Jews, one could take this statement and turn it into a baseless accusation that Jews wish to wipe out entire countries. Some Israeli secularists have even interpreted that traditional prayer as a call to destroy the secular majority of Israel’s Jewish population. This is why Jewish tradition abhors literal readings of sacred texts and relies on their rabbinical interpretations however far-fetched these may sometimes appear. For example, the rabbis unanimously interpret the biblical principle of “an eye for an eye” as an obligation to pay monetary compensation, not to get the culprit’s eye knocked out. The above piece of Jewish liturgy is a case of religious rhetoric relying on strong metaphors while expressing a desire to see a world without evil. More to the point, the last time Iran attacked another country was over three centuries ago. This is not exactly the record of Israel or the United States. To consider Iran somehow less responsible than Israel, which is reported to possess nuclear weapons, seems like an incongruous vestige of colonial mentality. Moreover, Iran is actively combating the extremists of Daesh (“the Islamic State”) who justify their atrocities by literal interpretations of the Koran. The Jews of Iran continue to practice Judaism without much interference from the Iranian authorities and remain committed to staying put in the country they have inhabited for thousands of years. While overtly anti-Zionist, Iranian leaders have emphasized that they are not anti-Jewish. Had they been anti-Jewish, Iranian authorities would have harassed local Jews rather than provoke a nuclear-armed Israel. Mr. Netanyahu’s claim to speak “on behalf of the Jews” endangers Jews, particularly in Iran. However, some Zionists remain undeterred and go as far as to reproach Iranian Jews for not leaving for Israel long ago. This attitude exposes the largest and perhaps the oldest Jewish community in the Muslim world since Israel’s raison d’Etat has naturally and often taken precedence over the welfare and the very survival of Jewish communities. Zionists relate to Jews outside Israel as potential immigrants or temporary assets in promoting Israel’s interests. Mr. Netanyahu’s appearance before the U.S. Congress and his current anti-Iran campaign has generated a profound schism between Jews who unconditionally support Israel and those Jews who reject or question Zionism and actions taken by the state of Israel. Public debate about Israel’s place in Jewish continuity has become open and candid, not only in Israel but elsewhere. Many see the future of the state of Israel as a state of its citizens, Jewish, Muslim, Christian and atheist, rather than a state established and run on behalf of world Jewry. While there are relatively few Jews who publicly wonder whether the chronically insecure Israel is “good for the Jews”, many more deplore that militant Zionism destroys Jewish moral values and endangers Jews both in Israel and elsewhere. For example, the film Munich by Steven Spielberg sharply focuses on the moral cost of Israel’s chronic reliance on force. During one scene, as a member of the Israeli hit squad hunting Diaspora Palestinian activists quits in disgust, he proclaims “we’re Jews. Jews don’t do wrong because our enemies do wrong…we’re supposed to be righteous. That’s a beautiful thing. That’s Jewish…” While Schindler’s List explores threats to the physical survival of the Jews, Munich exposes threats to their spiritual survival. No wonder that Likud supporters in America besmirched the Jewish director and his film even before it was released. It also lashed out at several recent books (Prophets Outcast, Wrestling with Zion, Myths of Zionism, The Question of Zion) that are concerned with the same essential conflict between Zionism and traditional Jewish values. Mr. Netanyahu’s speech before the U.S. Congress has deeply sharpened his intra-Jewish conflict. The Likud lobby routinely alleges that Jews who dare criticize Israel endanger its “right to exist” and foment anti-Semitism. This provokes a number of prominent Jews in Britain, Canada and the United States to speak out, which moved candid debate about Israel into mainstream, even conservative publications. The eminently pro-establishment Economist has published a survey of “the state of the Jews” and an editorial calling which calls on rank-and-file Diaspora Jews to move away from the “my country right or wrong” attitude adopted by many Jewish organizations. This certainly erodes the image of the Jews as a group united around the Israeli flag. Many Jews and Israelis believe that the Likud lobby, a collective effort of right-wing Christians, Jews, Muslims and atheists, is a major threat to Israel’s long-term security since it invariably supports Israel’s hawks and undermines those Israelis who work for reconciliation in the region. The lobby is also a potent source of anti-Semitism since it is often seen as “Jewish”, which creates the erroneous impression that the Jews dictate American foreign policy by pushing it to the right. In fact, a vast majority of American Jews have voted for Barak Obama. While Israel’s current leaders and their allies in America continue to incite the world against Iran, several peace organizations in Israel and in various Jewish Diasporas issued statements condemning the anti-Iran campaign and Mr. Netanyahu’s behaviour. Nowadays, when no Arab state poses a military threat to Israel it is Iran that many Israelis are made to fear. Just next to Iran, which has repeatedly denied any interest in acquiring a nuclear weapon, lies Pakistan, an unstable regime with a strong Islamist movement, including elements of Al-Qaeda, and a real, not imaginary, nuclear arsenal. While Pakistan has not threatened Israel, there may be no end to “existential threats” if the Zionist state stays its course and continues to defy the people of the entire region by denying justice to the Palestinians. The two emotionally charged claims hurled at Iran have dominated Western media. Another accusation that Iran had allegedly passed a law requiring Jews to wear a yellow insignia, reported by Toronto’s National Post a few years ago, further strengthened the image of Iran as a new Nazi Germany. While the report was retracted the following day, more people remember the damning news than the subsequent retraction from the daily whose owners are active in Canada’s own Likud lobby. This disinformation certainly helps prepare the public opinion for a military strike – by the United States or Israel – against the oil-rich Iran, a disquieting remake of the scare of Iraq’s illusory weapons of mass destruction that triggered an all-out military attack on that unfortunate country, whose population had suffered from Western sanctions for over a decade. Saddam Hussein was duly portrayed as another incarnation of Hitler, and, once again, the spectre of a nuclear Holocaust was invoked. It is Israel that reportedly possesses hundreds of nuclear weapons and, unlike Iran, refuses to sign the Nuclear Non-proliferation Treaty. Iran has never declared an intention to produce nuclear weapons. According to reputable Israeli experts, Iran cannot acquire a military nuclear capability for five to ten years, and if and when it does acquire it, they expect Iran to use it to restrain Israel’s foreign incursions rather than attack it. Iranian leaders are misrepresented as demented extremists with unlimited powers who can be expected to act irrationally. It follows that they must be stopped at any cost. This has become a mantra not only of the Israeli right wing politicians, such as the eloquent Mr. Netanyahu, who, in defiance of the U.N. Charter, overtly threatens to attack Iran, but for quite a few American politicians who admire him. While the White House and foreign policy and intelligence professionals know that neither Israel nor the United States are in danger of an attack from Iran, their rational arguments seem less persuasive than emotional rhetoric from the Hill. The United States has well known geopolitical interests in the Persian Gulf, but the accusations against Iran based on the deliberate conflation between Israel and the Jews may fatefully distort foreign policy making in Washington. Intellectuals appreciate precision. Policy-makers need it no less since they are expected to act prudently and rationally. Mr. Netanyahu’s intervention in America’s foreign policy making is part of a long-term attempt to align the lone superpower’s interests with those of the Zionist state. This is why his arguments should be weighed carefully and without undue emotion so often obscuring issues concerning Israel and its neighbours. For several years, Western chanceries have focused on restraining Israel from military action against Iran. Israel’s hands were thus freed to deal with the Palestinians with virtual impunity. The new “existential threat” from Iran’s hypothetical weapon of mass destruction has already served Israel’s purpose as a “weapon of mass distraction”. The phenomenal growth of Daesh graphically shows what demodernization and the ensuing despair in that part of the world may entail. We need only to look at Iraq, Libya and Syria, all three subjected to outside military intervention, and at the subsequent emergence of Daesh, to understand that destabilizing a country or region has far-reaching sinister consequences. Israel’s Prime minister invokes the alleged Iranian threat in order to slow down or reverse Iran’s policies of modernization. The forced demodernization of Iraq, Syria and Libya, the most secular and educated countries in the Arab world, has certainly benefited Israel’s strategic position in the area. Mr. Netanyahu must now explain how exactly demodernization of Iran will benefit the United States. Yakov Rabkin is Professor of History and associate of CERIUM, Centre for International Studies at the University of Montreal; he is the author of A Threat from Within: A Century of Jewish Opposition to Zionism (Palgrave Macmillan/Zed Books) and Comprendre l’Etat d’Israel (Ecosociete). Some of the material used in this article previously appeared in Revue internationale et stratégique 2/2008 (No 70), p. 195-208 in Paris.